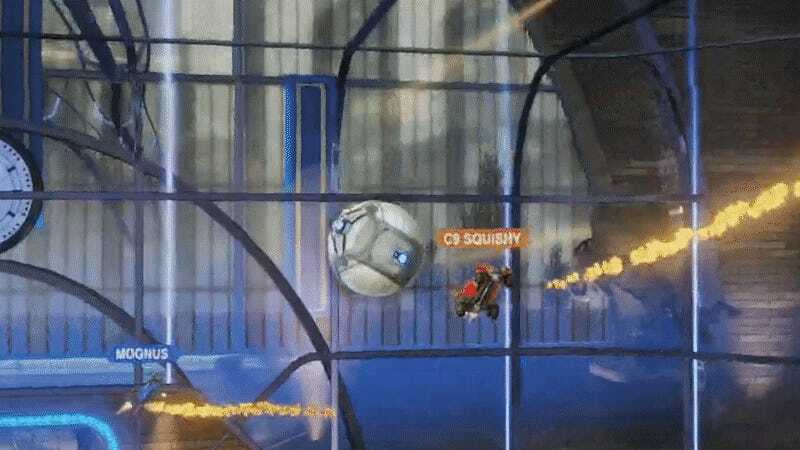 Mariano “Squishy” “SquishyMuffinz” Arruda’s Cloud9 team only finished third at this past weekend’s Rocket League season four finals in Washington, D.C., so Mr. Muffinz will have to settle for what might be the best single shot ever made in competitive Rocket League history. First, Arruda, playing as a red Hot Wheels-looking car, tips the ball up into the air and then drives up onto the ceiling to knock it back down and away towards the goal, a common approach. Think of Rocket League as basically soccer with cars, because that’s what it is. Arruda is watching the two defenders as he’s dipping down his trajectory towards the goal. Now, here’s where Rocket League’s unique use of all three axes comes in. Method has two defenders, Mognus and Mesanauris at the goal. Torment and Gimmick, Arruda’s Cloud9 teammates are waiting behind Arruda in case the ball is cleared. Arruda is alone and has to slip the ball through the gap between two defenders; Mognus goes high and Metsanauris stays low. Here, you would expect Arruda to try to split them either by hitting the ball straight or bouncing it off the ground to clear the low defender. Instead he drops below the ball, turns his car upside-down and flicks it a smidge upwards. It’s a level of three-dimensional play you can barely ever hope to predict as a defender, and never plan on routinely executing as an attacker. Watching it from Arruda’s point of view really shows how practiced he is in this kind of shot. Rocket League’s players have been experimenting with and perfecting air dribbles and flick shots since the game launched, but to have the dexterity and quick-thinking to pull that out in a championship match is unprecedented, and pushes the game’s skill ceiling to new heights.